Basel: Indian shuttler Sameer Verma dished out a clinical performance to outwit former World No 2 Jan O Jorgensen and clinch the men's singles title at the $150,000 Swiss Open Super 300 tournament on Sunday. The 23-year-old from Madhya Pradesh showed great anticipation and technique and added power in his smashes to bamboozle Jorgensen 21-15, 21-13 in a lop-sided contest. 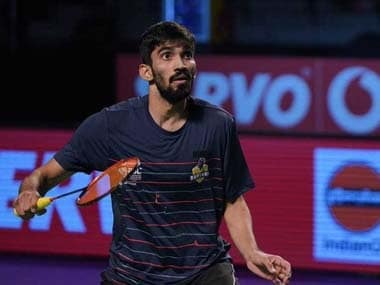 Sameer, who had clinched the Syed Modi Grand Prix Gold last year and reached the finals at 2016 Hong Kong Superseries, thus lifted his first title of the season and joined fellow Indians Kidambi Srikanth and HS Prannoy, who had won the title in 2015 and 2016. Up against Jorgensen, who made a comeback this season after missing in action for more than seven months following a heel injury, Sameer showed great touch and control to emerge victories in the 36-minute contest. Sameer opened up a 3-0 lead early and capitalised on it to enter the break with a 11-7 advantage. He never gave an inch to his rival to make a comeback. Jorgensen won a video referral after the interval and narrowed the gap to 10-12 but Sameer jumped to 17-10 with five straight points before pocketing the opening game comfortably when the Danish shuttler hit the net. The first game lasted 17 minutes. In the second game, the duo split the first 10 points before Sameer produced a series of powerful cross court smashes and aided by a few miscued shot by his rival moved to an advantage of 11-6 at the lemon break. Jorgensen constructed the next two rallies well to fetch two points but a net error handed the serve back to the Indian. The Dane left the shuttle but lost the video referral by a narrow margin. Sameer mixed the shots well and used a deceptive return to move to 14-9. A lucky net chord gave him another point as Sameer inched closer to the title when Jorgensen hit wide. Sameer sent the shuttle out and then struggled with a low lift at the forecourt to give two points to his rival. Jorgensen tried to slow the pace and induce errors from Sameer but he soon sent the shuttle wide twice. The first gave Sameer a seven match points, while the second he challenged even as Sameer sprawled on the court and lifted his arms in celebration.